When we were all kids, we played in the dirt, well, I hope you did. We were fascinated by watching things grow. We had Legos and Lincoln Logs. We all did that experiment where you poke toothpicks into an avocado pit to grow a tree, right? 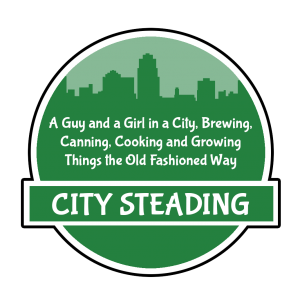 It’s that fascination with growing things, making things that many of us grow out of that sparked the idea behind City Steading… well, at least in part. We are primarily a YouTube Channel, but we post here from time to time (though not enough). More than half the calories that we take in as Americans (sorry, I’m in the United States, other countries do this much better than we do) is from “processed food”. Now, when I hear that term, I cringe, and think of “pink slime” from McDonalds. Sad, but true. Processed Food, by definition is: “taking ingredients and making them into something convenient and simple for the consumer to prepare”, which, on the surface sounds all fine and dandy. Sadly though, the methods used are sometimes suspect, as in… chemicals. I’m not a fan of eating things that I can’t pronounce, and I can’t believe genetically modified food is still allowed here legally. We avoid as much of that nonsense as possible. We converted our entire backyard into our very own homestead, just like those folks that live off the grid. Well, almost. We have no goats or cows, but we do have chickens! We have our very own vineyard (it used to be a greenhouse but the vines had other ideas), and our pride and joy, waist level raised gardening beds. We also have about three dozen huge pots, 8 Mulberry trees, a lemon tree, 2 lime trees, an avocado tree (no, doesn’t fruit, ugh), a banana tree, and a starfruit tree, as well as another smaller set of raised beds. That’s just the growing part. We don’t buy bread, ham, soda, beer, wine or any alcohol really except the distilled spirits since it’s illegal to distill in Florida (stupid law), so… we don’t break the rules and Brian loves his whiskey. We make as much of our food as we can, and keep all those chemicals out. Of course, there are limitations to what we can do, and we know it. That’s the challenge, to balance a life with a lifestyle. We make videos and write articles about gardening, brewing beer, making wine, cider, and mead (yes, mead). We teach others how to learn from our mistakes and try something new for themselves. In the process, we try to have a little fun too. We love sustainable products, organic gardening, homebrewing, and home cooking. So grab a chair, and a lovely beverage (homemade would be nice), sit back, and let us show you all our experiences, from our successes to our failures, and everything inbetween. After all, if you make as much of your own food as possible, what’s the worst that can happen? You just might live longer. That’s the thing about life though, nobody gets out alive. May as well eat good food, drink good wine, and know where it all comes from. There’s a certain satisfaction to that. So welcome, and we hope you enjoy.